A Quick Journey to Future of the Hospitality Industry! 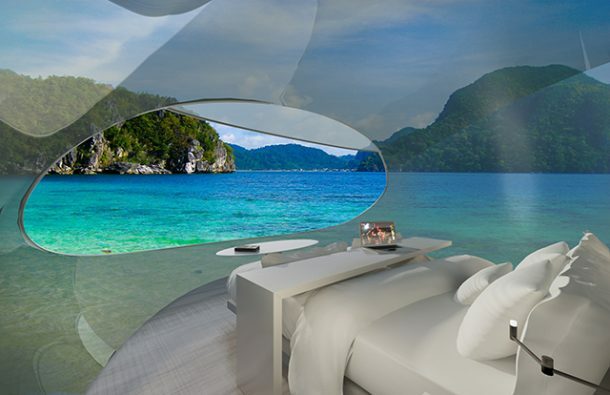 This post aims to take you on a short trip to the future of the hospitality industry. Whether you belong to the Hotel industry or are a star of the tourism sector or are a travel fanatic; this post should be of some interest to you. We are talking about innovation, technology and the future of the Hospitality industry in this article. The hospitality industry is not only about hotels, dining in and lodging. It is a wide platform of various fields of the service industry. It comprises lodging, entertainment, event planning, transportation, cruise lines, food and beverages, recreational sports and many other services. In this article, we discuss the future of the hospitality industry. From magnificent innovation in the hospitality industry like Driftscape to the visionary futuristic hospitality innovation in YUselect; there is a lot to rejoice in the hospitality industry. Let’s start with a quick 1-minute video about the future of hospitality shared by Chief innovation officer of EHL, Switzerland. Well, we have just begun. The Hotel industry is embracing technology to come up with Innovative Hotel concepts to amaze the customers. Read on to know more about what’s in store for the hospitality industry in future. While this might be something that looks like a fictional movie but it can soon be a reality. But, why do we even discuss the future of the hospitality industry? Is this industry really important for the global industry? Well, you all know the answer. The hospitality industry is growing at a pace more than almost all other industries. With the passage of time, the hospitality industry has transformed itself into a multibillion-dollar industry. Amongst the gradual dwindling condition of the economy worldwide, hotel and hospitality industry has kept on going with adding something or the other to make the people happy. The agenda is to make people happy with providing the best of luxuries and amenities. This clearly ascertains the fact that the hospitality industry has a lot to offer and has a long way to go. Information Technology thus holds the key to the future of hospitality and social media will have a big role to play to define the steps. Before we continue our journey to the future of the hospitality industry, below are few facts to support our assertions about the Hospitality industry. Skip the section if you already have the facts on your fingertips and jump to the future. 35-40% of travel agencies use social media for bookings. 40-45% of people use mobile phones for payment of hospitality costs. Mostly in restaurants. Within the hospitality industry, 35-45% of the bookings occurred online in the last years. Up to 60% of the benefits and profits were generated by the hospitality industry by posting about their deals on social media. Because of an upheaval of job satisfaction, hotels, for instance, are earning 15-20% more than before. To engage with customers, 90% of the hospitality industries are utilising social media. Up to 70% of the population tends to go for reviews. These figures are expected to go higher with the trends going on. There are other facts about the hospitality industry that might amaze you. Everything and everyone is improvising. The hospitality industry is the fastest growing of industries. Because it is a myriad of different services, it has a wider aspect and scope to enhance and improve its operations. Hotel smartphone app is a rage now. Hotels are taking it a step further by allowing the guests to control their rooms and access services. In some hotels, guests use smartphones as room keys. Also, guests can adjust lighting, temperatures and change channels on TV. So look out for Contemporary Hospitality Apps that are going to shape the future of the hospitality industry. There is hope that hotels could take controls further and guests can personalise their rooms even. The millennials – who are born in 1980s-1990s are very tech-driven and 85% own a smartphone. That is why a smartphone is a good way to catch their attention. Another rapidly growing trend is beacon technology. This allows two-way communication between the guest’s phone and small beacons set around the hotel. They can be used to push the guests to use hotel services with promotional offers sent to their phones directly. The Beacon technology and augmented reality are push form of marketing initiative riding high on the technological innovation. In 2017, it is expected that virtual reality is going to blow everyone’s mind. 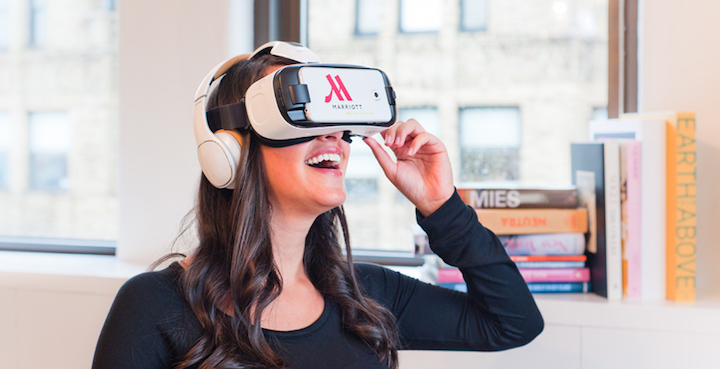 Prospective customers can see themselves in your spa or hotel through virtual reality. Event planners, travellers can take a tour of your hotel, suites, pool and other areas. Marriott is already doing it. Plus, Marriott has a lot of other innovation in hospitality to offer. Future can bring up a virtual concierge which can allow guests to tour the local places and landmarks. Think of possibilities and you will find them all in range. The future of the hospitality industry will have a huge intervention of technology. Look out for more trends of the hospitality industry in 2016 and that will help us all imagine where the hospitality industry is heading towards. But, here’s something else for you. Look at this amazing innovation within the hospitality industry. Did we hear someone saying that hospitality industry lacks innovation? Well, read this news to know how hospitality and innovation go hand in hand. HOK is a Canadian-based firm, which won the 2016 Radical Innovation Award – a hotel that looks for imaginative hotel designs. In June, seven hotel investors, architects and developers chose Driftscape as a finalist out of 50 submissions from about 30 countries. Now, this is part of the bright future of the hospitality industry. Roughly 200 hospitality industry professionals determined Driftscape to be declared the winner on Oct. 5, 2016. 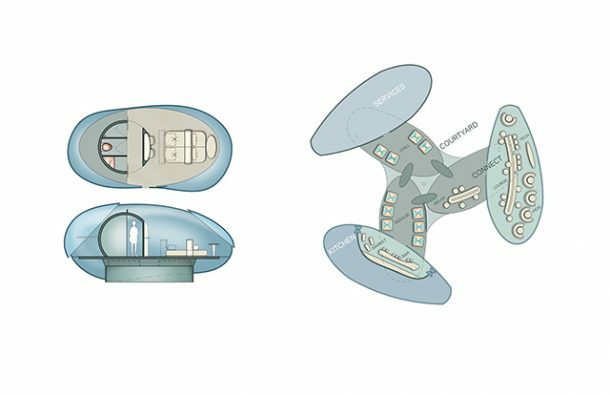 Driftscape’s room pods are connected to the primary stationary hub but are detachable so guests can fly to a specific location. According to the HOK team, it’s known as a drone hotel. With this design, it allows travellers a whole new way to explore the area. Isn’t this interesting and novel? What an amazing hospitality innovation indeed. John Hardy, the award founder, said the idea won because it’s different from other hotels. He said it’s meeting a thriving market demand for unique experiences, which is what the drone hotel has done. The hotel will have 10 to 15 flying pods that are affixed to the primary hub that includes the main lobby, restaurant, bar and lounge. This will be a new experience for travellers. Thinking about the possibility and feasibility of such a project. It will soon be a reality. The 200-square foot pod will hold two adults and includes a queen bed, bathroom and desk. For larger groups to be accommodated, the pods are attachable to each other. In order to fly the pod, guests need work with hotel staff to create a personalised flight plan. The pod will detach from the key part of the hotel, and the artificially intelligent system ensures the flight plan is followed automatically. Guests can sit back and watch the world go by. Once the flight plan is over, the pod returns to the hub for reconnection. Every pod has a dashboard with a camera so guests may take pictures as they fly around. No definitive plans for when the first Driftscape would be built, as drone technology is not yet advanced enough. And, the pods need a powerful motor than drone has currently equipped with. Hardy said the premise behind the Radical Innovation Award is to bring imagination to life, even if it’s decades from now. If Driftscape does become a reality, the cost would be the same as a luxury car rental. Isn’t this great. The future of hospitality is filled with innovation. If you look at the various Sectors of the Hospitality industry, you would come to know that the global economy is heavily dependent on how the hospitality industry performs in the future. Finally some words of encouragement for your loyal subscribers. If you belong to this industry, your job is secure and the future will see a lot more opportunities being created. The hospitality industry has a huge scope and limitless options for skilful job seekers as it is not limited to one service industry. and many other fields in the overall hospitality industry. If reports are to be believed 1 in 10 people on the planet will be employed by the hospitality industry by 2023. There would be around 73 million new jobs that will be created in the travel and tourism. When the world fights unemployment issues, hospitality industry seems like a respite. So, if you are working in the hospitality industry or have plans to be a part of this industry; you seem to have got that right. And you might find some interesting co-workers in the future. So, what else can we expect to see in the hospitality industry in near future? The image below from the article Robotics in food service can definitely give a clue. Don’t be surprised when you walk into a fast food outlet and meet the guy below to welcome you.